WASHINGTON, USA: Google, environmentalists and governments have unveiled a state-of-the-art database to track deforestation, hoping to increase levels of law enforcement to prevent it. The website, Global Forest Watch, will show tree loss around the world in high resolution and with frequent updates. The data, aimed both at policymakers and companies buying from forest areas, will be available for free and not require much technical skill to use. The planet lost some 2.3m square kilometers of forest between 2000 and, according to data by Google and the University of Maryland, despite what some environmentalists call good-faith efforts by nations such as Indonesia. "The problem to date hasn't been the lack of goodwill, or even the lack of nice forest regulations and laws. It has been, among other things, the lack of ability to really know what's going on," said Andrew Steer, chief executive of the World Resources Institute that helped create the database. "When the president of Indonesia passed good laws on forests, it was very difficult for him to know what was actually going on in real-time," Steer told reporters ahead of Global Forest Watch's launch in Washington. "The database will allow anyone to look online and verify the boundaries of protected forests, including buyers of palm oil who want to avoid illicit production," Steer said. 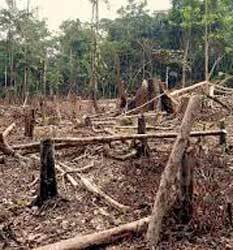 Deforestation plays a critical role in worsening climate change as forests, which cover nearly a third of the planet, act as a natural sink, trapping carbon emissions that would otherwise head into the atmosphere. To set up the database, Google uploaded millions of satellite images that had been collected for more than 40 years by the US Geological Survey. Rebecca Moore, an engineering manager at Google, said the company studied deforestation and found that the main challenge was to manage the enormous scale of the data" to a level of detail that is useful. "The company used its Google Cloud technology to bring turbo-powered science to the problem," she said. Besides Google, contributors to Global Forest Watch include the governments of Norway, Britain and the United States. US Secretary of State John Kerry, in a speech in Jakarta, called climate change "the world's largest weapon of mass destruction" and urged Indonesia as well as other countries to do more to prevent it. Heru Prasetyo, the head of Indonesia's anti-deforestation agency, praised the Global Forest Watch in a statement, calling it an "effective tool for the world and each nation as we leave neglect and ignorance in the past."